The Canberra Critics’ Circle recently began an informal weekly series ‘In conversation with …’ designed to bring critics from various disciplines into contact with practising artists across art forms who are either visiting or resident in Canberra. Dancer Paul Knobloch was the Circle’s first guest. Knobloch was in Canberra on what has become a regular return to his home city during the northern hemisphere summer break. A graduate of the Australian Ballet School, Knobloch currently performs with Alonzo King LINES Ballet, which has its home base in San Francisco and which Knobloch joined in February 2012. Before that he was a member of Bejart Ballet Lausanne. He has also had stints with the English National Ballet in London and has worked in Australia with West Australian Ballet and the Australian Ballet. Knobloch talked with the Circle about his current work and remarked that he has had a busy half year so far in 2013 with a collaboration between King’s company and Hubbard Street Dance Chicago. In particular, they have been performing works that grew from a residency for the two companies at the University of California at Irvine. He went on to talk enthusiastically about a collaboration with Grammy Award-winning double bassist Edgar Meyer. 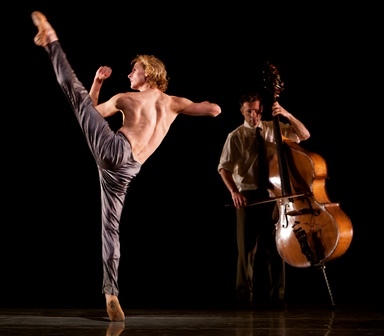 The work, called Meyer, has Meyer and two string players performing on stage and Knobloch recalls that at one point he found himself dancing a solo just centimetres from Meyer’s 100-year-old double bass. Despite this somewhat daunting experience, Knobloch counts dancing in this work as ‘like nothing I had experienced before’. Knobloch has also been taking classes in the Gaga movement language and spoke to the Circle about its effects on his work and his approach to dance. The movement language known as Gaga was developed by Ohad Naharin, inspired and admired director of the Israeli group, Batsheva Dance Company. The name refers to the baby gibberish ‘ga-ga’, and, when asked why he called his new dance language Gaga, Naharin explained: ‘I called it Gaga because I was tired of saying “my language of movement”. I understood that it was worthy of a name and I wanted to detach it from me. I didn’t want it to be Ohad Naharin’s language of movement’. The Gaga movement language is used by the professional dancers of the Batsheva company as part of their day-to-day training and Naharin stresses that Gaga doesn’t go against ballet or ruin a dancer’s technique. It improves technique and supports the language dancers already know. It is a way of gaining knowledge and self-awareness through the body. Knobloch is also considering his future and continues to have choreographic aspirations. His most recent choreographic work is Facets of Light, commissioned by Ballet Victoria, British Columbia, in 2011. At present though he is still enjoying ‘living out of a suitcase’ as LINES pursues its extensive touring of the festival circuit. While in Canberra Knobloch will also dance at the annual performance by students from his former dance school, Canberra Dance Development Centre, and will present the award for best performance by a female dancer at the 2013 Australian Dance Awards to take place on 5 August at the Playhouse, Canberra Theatre Centre. Michelle, thanks for this post, which was great background to seeing Paul dance last night at The Canberra Theatre. It is lovely when a dancer who started training in Canberra comes back as regularly as Paul does, and it was a pleasure to see his performance. It will be good to catch up with him tomorrow night at the 2013 Australian Dance Awards at The Playhouse! Thanks Lauren. It certainly was interesting to see Paul last night at the Canberra Dance Development Centre performance. His solo at the beginning of the show made me realise how he has adapted his style of dancing in recent years. It is now much more improvisational (for want of a better word) rather than confined within a technique, which in turn made me realise how he must have enjoyed and benefitted from the Gaga classes and from being with LINES.